“Concentration nurtured with virtue is of great fruit, great reward. Discernment nurtured with concentration is of great fruit, great reward. 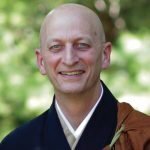 The mind nurtured with discernment is rightly released.” In this talk from November’s Shuso Hossen Sesshin, Shugen Roshi delves into this simple yet profound teaching from the Pali Canon. Ethical action, meditation and insight rely on and support each other, he notes, forming a unified path which can address the many aspects of our humanity.